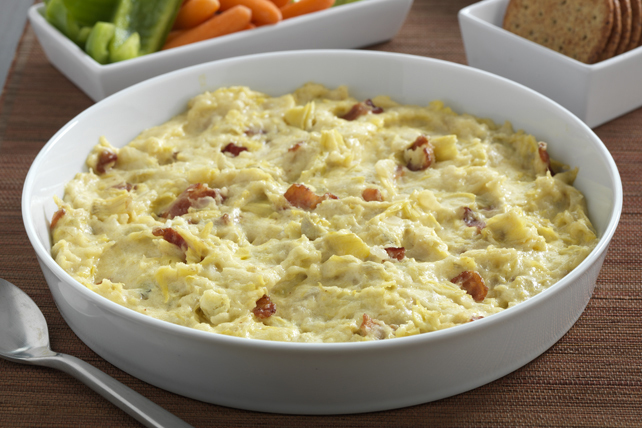 They'll know it's a party when they see this appetizer on the table: a glorious hot artichoke dip with sweet caramelized onions and crispy bits of bacon. Heat oil in small skillet on medium heat. Add sweet onions; cook 12 to 15 min. or until tender and golden brown, stirring occasionally. Remove from heat. Add all remaining ingredients except green onions; mix well. Spoon into shallow ovenproof dish sprayed with cooking spray. Bake 20 to 25 min. or until hot and bubbly. Sprinkle with green onions. Serve with crackers or fresh vegetable dippers, such as bell pepper wedges, large mushroom caps and/or thick diagonally cut carrot slices. This delicious dip can be mixed together ahead of time. Refrigerate up to 3 days. When ready to serve, bake in 350°F oven 25 to 30 min. or until dip is heated through and top is lightly browned. Sprinkle with green onions. Substitute a 9-inch pie plate for the ovenproof dish.